The sacroiliac joints in the hip region of the body are specialized joints that provide support and permits flexibility to the upper extremity. These joints combine the hip bones to the wedge-shaped sacrum that is located just above the tail bone at the base of the trunk. In the pelvis are two sacroiliac joints, two hip bones (or iliac bones) and one sacrum bone. There is also the symphysis pubis joint, which is another source of pelvic pain called osteitis pubis. 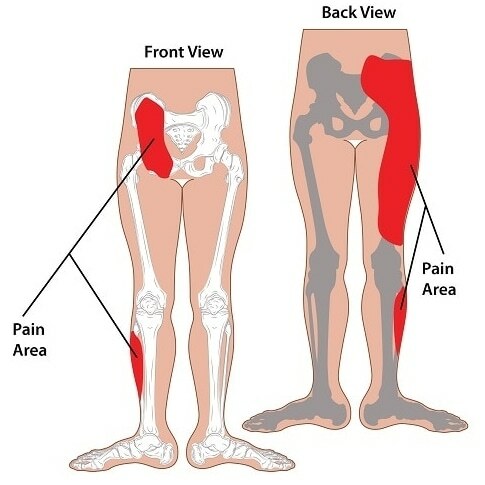 Many view the sacroiliac joints as stress relievers that protect the pelvis from fracture due to the many forces that acts on it, or from bipedal movements. When walking, the sacroiliac joint provides sufficient flexibility to facilitate the transfer of forces that act on the pelvis to and from the lower spine and the lower extremities. The size of the joint is small and its motion, which is very limited, is not controlled by active muscle contractions. The sacroiliac joint as a source of lower back pain has been a controversial topic. Some believe that it is a significant source of lower back pain, while others believe that it is an irrelevant source. It is, however, now widely accepted that 13-25% of patients with chronic lower back pain is due to the sacroiliac joint. The sacroiliac joint is 20 times more susceptible to compression failure and two times more susceptible to torsion overloading than other lower back segments. The different causes of sacroiliac joint pain are widespread and versatile. Athletes are at risk of sacroiliac joint pain (SI joint pain) due to excessive or reduced motion in the sacroiliac joint. Localized pain in the lower back or buttocks when extending the body. Back pain may be localized to only one side of the body. Predisposition to women to sacroiliac joint pain due to increased weight gain, the tendency to lean backwards, the mechanical trauma of childbirth, and increased flexibility in the ligaments that allows the pelvis to widen in preparation for childbirth. Sacroiliac joint dysfunction (SI joint pain) as a source of pain is very challenging to diagnosis. There are dozens of physical examinations that have been recommended for the diagnosis of SI joint pain, however, even physical examinations and medical history have been found to be inconsistent in diagnosing sacroiliac joint dysfunction. Unfortunately, radiologic imaging is also insufficient in diagnosing sacroiliac joint pain. The most commonly used method of diagnosis is the use of small-volume local anaesthetic blocks. It is also believed to be the most reliable method, although the validity remains unproven. There are many factors that affect the reliability of results generated from the use of diagnostic blocks, including the placebo effect, expectation bias and systemic absorption of the local anaesthetic. The local anaesthetic can also leak into other possible pain generating structures such as the muscles, nerves, and ligaments, which can lead to false negative blocks. A false negative can also result in the inadequate amount of local anaesthetic is used to spread to all parts of the sacroiliac joint. The use of diagnostic blocks is also one of the most difficult spinal injection procedures to perform. Treating SI joint pain is one of the most challenging tasks faced by physicians, and a number of different therapies are used for treatment. Broadly speaking, treatment can be divided into two categories: treating the underlining disorder and alleviating symptoms. Conservative treatment should address the underlining problem that is causing the pain. At the same time ice, non-steroidal anti-inflammatory drugs (NSAIDs) and activity modification can be employed to alleviate symptoms of SI joint pain. Physical therapy can help stabilize the pelvis and strengthen the hip girdle and abdomen. Intraarticular injections, as described above in diagnosis, can also be used as part of the treatment to alleviate pain. These injections have been found to provide good pain relief for 6 months to 1 year. Surgical intervention to stabilize the joint can be considered for those patients unresponsive to conservative treatment. Cohen, S. P. (2005) Sacroiliac joint pain: a comprehensive review of anatomy, diagnosis, and treatment, Anesth Analg 101, 1440-1453. Ombregt, L. (2013) A System of Orthopaedic Medicine, 3rd ed., Elsevier. Vleeming, A., Schuenke, M. D., Masi, A. T., Carreiro, J. E., Danneels, L., and Willard, F. H. (2012) The sacroiliac joint: an overview of its anatomy, function and potential clinical implications, J Anat 221, 537-567. Forst, S. L., Wheeler, M. T., Fortin, J. D., and Vilensky, J. A. (2006) The sacroiliac joint: anatomy, physiology and clinical significance, Pain Physician 9, 61-67. MedlinePlus. (2014) Sacroiliac joint pain – aftercare. Purcell, L., and Micheli, L. (2009) Low back pain in young athletes, Sports Health 1, 212-222. Cohen, S. P., Chen, Y., and Neufeld, N. J. (2013) Sacroiliac joint pain: a comprehensive review of epidemiology, diagnosis and treatment, Expert Rev Neurother 13, 99-116.